Recently I provided an update on my progress on my main lifts. 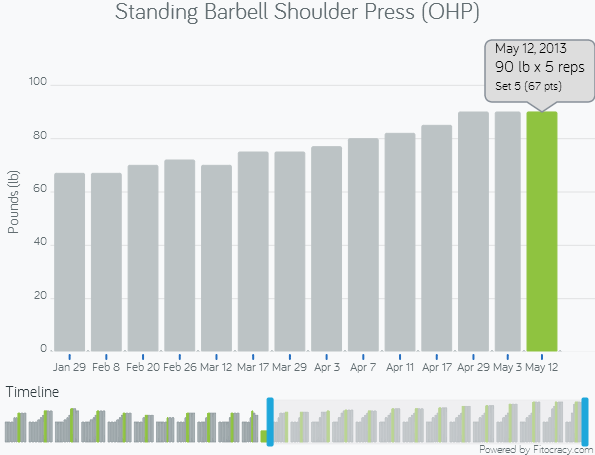 As of 4/21/13, I’ve made progress on all my lifts but gotten stuck on a several. Despite the PR’s, my mass has only risen to the 172-176# range. In addition to the five main lifts, I added chin-ups, pull-ups, weighted hyperextensions, as per Starting Strength’s addendum Practical Programming. Additionally, I’ve been doing some light running in central park on the weekends and running the .2 miles to and from the gym. I probably could have gone farther before stalling if I was able to pack on more pounds, but I don’t find it easy to gain weight unless I’m constantly drinking whole milk… which has it’s own set of issues. 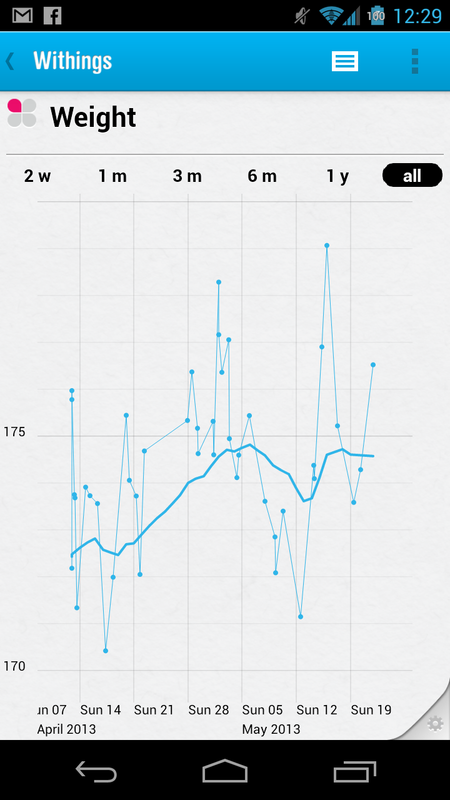 Here’s my graph of recent weight. In addition to training, I also got more coaching by one of the pro’s at Crossfit Virtuosity in Williamsburg. My form on several lifts is less than perfect, mostly due to lack of mobility rather than ignorance. 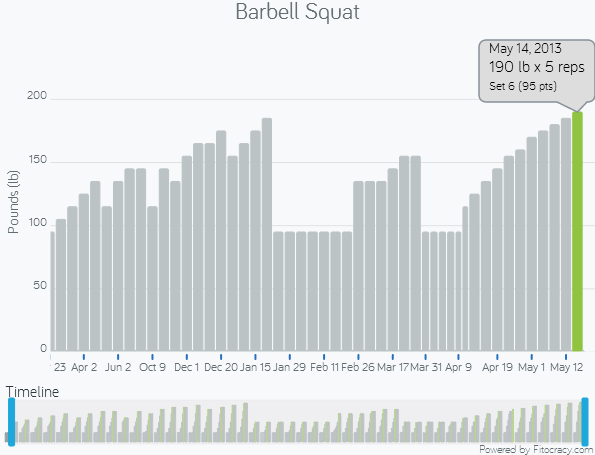 All of the time I spent practicing back squat at 95# and 135# I was stretching almost everyday to build the mobility to be able to squat to parallel properly. Today I can squat to parallel, but only with a very very wide stance that I’m afraid is putting stress on my hip muscles. Similarly, I made good progress on my Standing Press but stalled at 90#, a decidedly unimpressive number. At 90#, I started experiencing some pain in my lower back. I thought I could power through 90# by microloading but no, I stalled big time. Bench Press was hard. 126# was a sticking point, I reset, and hit it again, but I’m experiencing some light shoulder pain. The solution to both issues was another session with my coach. He pointed out my exact mistakes. My shoulder mobility is so bad (from the repeated traumatic injuries) that i’m hyperextending my back to bring the weight overhead in the press. This is quite stressful to it. 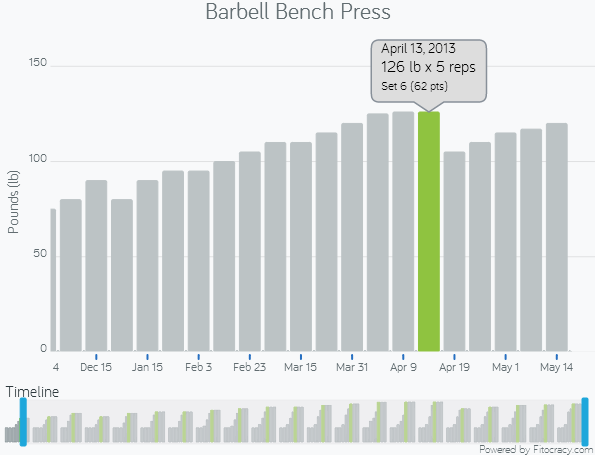 Bench Press appears to be an easier issue to work on. In June, July, and October, I’ve got five upcoming Obstacle Races: Spartan Sprint, Rugged Maniac, Rebel Race, Warrior Dash, and Tough Mudder. I’m not so concerned about the 5K races, as I did the last race in arguably worse shape than I am now. The Tough Mudder is going to be a bear so I’d like to work up to it gradually. Based on my desire to improve my form/mobility, cut my body fat %, and train for the upcoming obstacle races, my routine will be changing from a raw strength focus to more GPP focused. 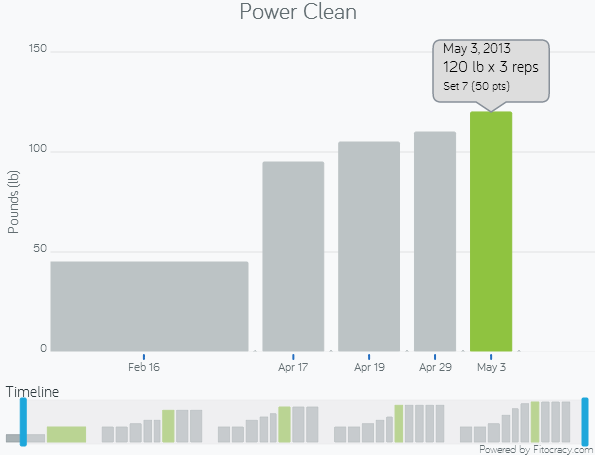 More kettle bells, more tabata workouts, more sprints, and more long-slow distance. 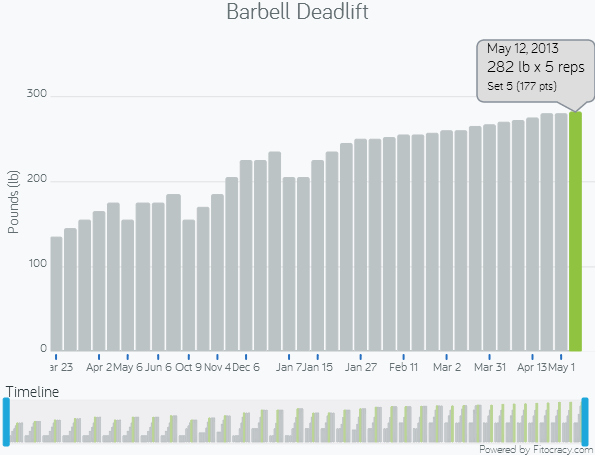 Diet wise, I’ll be cutting back from my 4000+ kcal/day diet to something approaching more steady state for me. My guide on the mobility/form side is a new book called Becoming a Supple Leopard by Kelly Starrett. Honestly, the book title is crazytown, but if it helps me squat and press with better form, I don’t care. My lifting coach is in the book, so that’s cool.